ANGELIQUE MINIATURES CELEBRATES 28 YEARS TODAY! To celebrate this anniversary I thought I would share some pictures of my favourite doll projects from more recent years (since digital cameras and the internet!!!). 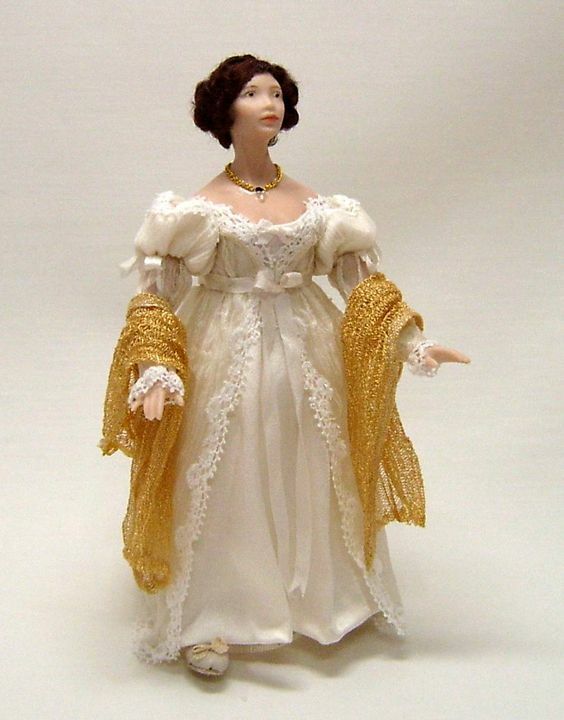 Anne Boleyn costume for 16 inch fashion doll. Miniature Fairy riding a unicorn. Princess Diana wedding gown on miniature mannequin. Miniature late Victorian Summer Bride. Custom made Aurora Rose tutu for 16 inch ballerina doll. Miniature Giselle or Sylphide tutu set. Miniature Fairy Slippers (shown with an English penny and American five cent piece). Miniature Fairy Flower Seller with her unicorn companion and helper. Miniature Brown silk bonnet with shirred ivory silk lining and matching reticule. Miniature striped cotton walking dress with matching tall bonnet and reticule. Something for the Maid. A much plainer miniature cotton house dress and apron along with a little mop cap. 18th Century Marie Antoinette style gown modelled by 16 inch Tyler Wentworth. Made in pure silk. Miniature Dita Von Teese style gown and hat. one twelfth style. Valentine Ball gown for 16 inch fashion doll. Miniature Faerie of Spring and New Life. Miniature Princess Grace wedding gown on mannequin. The miniature Elizabeth Bennett Regency wedding bonnet. 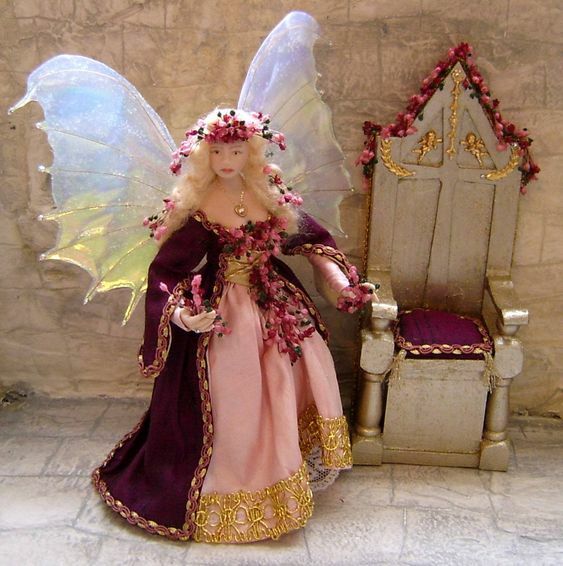 Front view of the miniature Fairy Harp. The harp stood about six and a half inches tall. Miniature Young King Henry VIII and Katherine of Aragon. 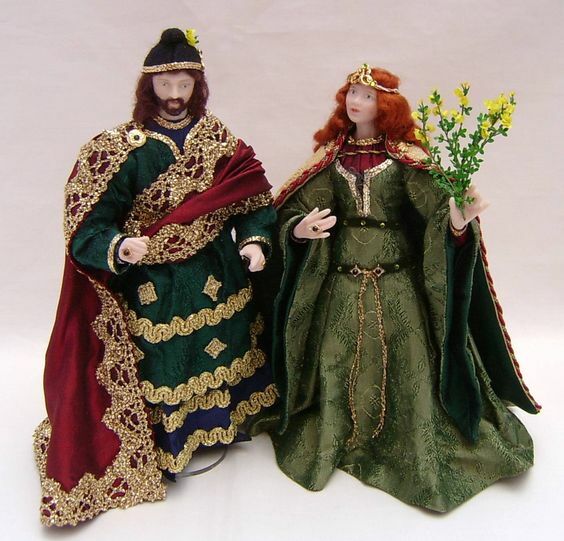 Miniature King Richard III with his wife Queen Anne Neville. 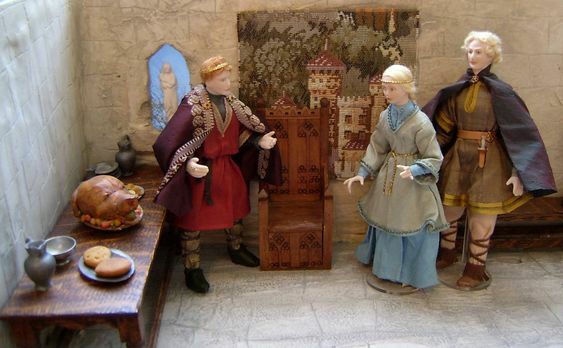 Miniature King John and his wife Queen Isabella. Miniature Elizabeth 1st doll complete in room setting. Miniature Ross and Demelza Poldark. Miniature Anne Boleyn and Thomas Cranmer. Battle of Flodden (c 1513) Scottish Pikeman outfit for action figue (around 12 inches tall). 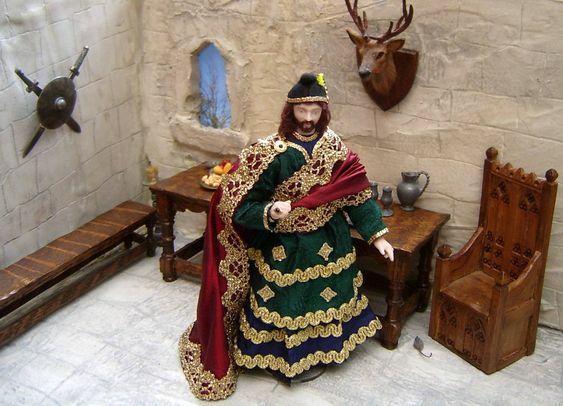 Coronation robes for 17 inch male fashion doll. Victorian underwear for 16 inch fashion doll. ‘Romanza’ ballet costume for 16 inch ballerina doll. French (Breton) costume for 16 inch doll. Alice in Wonderland costume for 12 inch fashion doll. Miniature Lord Byron Albanian costume. Miniature Lord Byron Regency tail coat outfit. 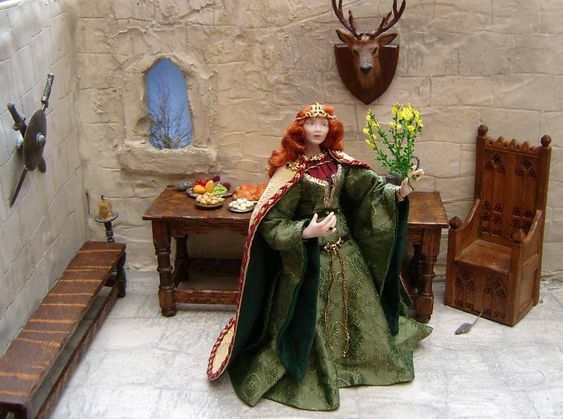 Medieval style Autumn costume for 16 inch fashion doll. Miniature Queen Mary 1st (Mary Tudor). I hope you have enjoyed my selection…just a few of the many favourites I have created over the last few years. All of them have given me enormous pleasure and taught me such valuable skills and patience. There see!……..I told you I’d be back, didn’t I? Remember I told you about Tracie, the lovely lady who has commissioned quite a few very interesting wedding gowns in miniature from me. She is the lady who owns the miniature church and holds exhibitions in it on her blog. (I hope that you were able to go and visit Tracie’s blog and see the wonderful miniature church and exhibits in it). Anyway, amongst Tracie’s interests is the Regency period, (the early 1800’s) that most elegant era at the end of the Georgian period but before the Victorian. Amongst the miniature Regency costumes that I was asked to make for Tracie was the wedding gown of Lady Byron. I made this costume on a mannequin. 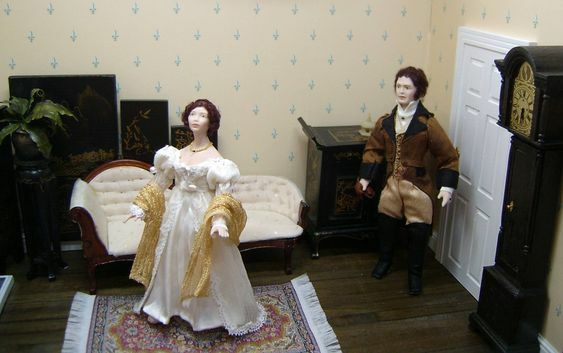 Miniature version of Lady Byron's Regency wedding gown. Tracie was lucky enough to be able to visit the costume museum in Bath in order to have a private viewing of Lady Byron’s wedding attire and was even allowed to touch it and take close-up photos of it!!!!!! I don’t usually feel envy but I have to admit I was almost emerald at that one!! Despite being in quite delicate condition, Tracie was able to take some wonderful photos and the above interpretation in miniature is as a result of the pictures that she took. The real dress was made from light-weight cotton trimmed with cotton lace and is very plain compared to some of the celebrity wedding gowns that we are used to today. However, it was indeed bang on trend in it its simplicity for those times. My moniature version is also made from very fine cotton trimmed with narrow cotton lace that has been cut down from a much too wide lace. Whilst at the costume museum, Trace was also able to see…….. and touch(……….excuse me while I just flush emerald again!!!) Lady Byron’s wedding pelisse (a pelisse is a type of ladies Regency long coat). The pelisse was made in creamy coloured silk and was apparently quite dirty, especially along the hem. This is probably not too unusual as the Byron’s were married in Winter. The real one had quite a warm lining which of course Lady Byron would have needed for a Winter wedding over that thin little cotton dress. Lady Byron miniature wedding pelisse. The other miniature Regency silk wedding pelisse on a hanger. A fancy miniature Regency wedding gown and matching bonnet. Close up view of the back of the Regency wedding wide-brimmed bonnet. Slightly plainer but still as charming miniature Regency wedding gown. Not to be left out of the wedding dress fiesta, here are a couple of the larger dolls modelling theirs. First up is the Spring Bride wedding gown and veil modelled here by 16 inch Tyler Wentworth. This gown was made in ivory silk dupion ruched at the hem with little cream and yellow rose buds and worn over a petticoat trimmed with delicate cotton lace. Underneath was a stiff net petticoat to hold out the skirt. Spring Bride modelled by Tyler. Next is Clea Bella the 16 inch ballerina modelling a One Of A Kind long tutu called ‘Wedding Belle’ This one was made using a small remnant (a lucky find!) of embroidered and beaded organza and was placed over the net tutu layers. I managed to find a lace trim that was very similar to the border of the fabric and this was used both to trim the dress and the tulle veil. Wedding Belle modelled by Clea Bella. Last but by no means least in the wedding own fiesta are two miniature dolls. The first one you have seen before in a previous post last year and this is the Late Victorian Summer bride. Dressed in ivory silk trimmed with cotton lace, this bride’s costume is typical of the 1870’s /1880’s. Below is the other miniature bride and this time she dressed in a much earlier style based on the crinolines of the mid 1800’s. This is the Winter Bride wearing a coat of ‘fur’-trimmed cream silk jacquard with large bell-shaped sleeves and a matching cream ‘fur’ muff. The coat is worn over a full ivory silk skirt with a deep frill of delicate cotton lace along with a lace-trimmed blouse, embellished with timy crystals. On her head is a small matching bonnet with a dainty little tulle veil that drapes over the back of her hair. What does this beautiful dragon to do with the month of April? Would you like a clue?……….OK………..the clue is: 23rd April. If you think you know the answer, just for fun, leave me a message at the end of this post. In the meantime, you might like to visit Tracie’s blog page to see her lovely costume (and other) displays in her miniature church. Please also take a look at the latest AIM (Artisans In Miniature) on-line magazine here. Until next time……bye for now. MARCH IS HERE WITH SHAMROCKS AND DAFFODILS. Gosh! Doesn’t time fly? It was only last week that I was writing February’s blog, wasn’t it?!!! And yet here we are already in March. Although the daffodils and crocuses are already out here, the wind is still chilly and reminding us the Winter may not have finished with us just yet. But lots of buds and pretty flowers and blossoms are starting up so Spring is definately on her way. The season of Spring has inspired many a doll and costume for me, not least my Faerie Of Spring and New Life. This miniature one twelfth scale doll is dressed in the colours of Spring leaves and snowdrop white with flowers of daffodil yellow and forgetmenot blue. Her trusty steed, a snowy white unicorn accompanies her as she carries her little baby in a flower-filled basket. The Faerie of Spring and New Life. On the subject of daffodils, it was St.David’s day on 1st March. St. David is the patron saint of Wales and the daffodil is the Welsh national flower. So in honour of all my Welsh friends and readers, here is a ballet costume that I designed and made several years ago for the 16 inch ballerina doll, Clea Bella. This costume was inspired by some lovely miniature artificial daffodils that I was lucky enough to find. I used them to decorate Clea’s hair and she is also holding some as she dances. Clea Bella modelling the Spring tutu with mini daffodils. Talking of patron saints, March also sees the celebration of another famous saint, St. Patrick, the patron saint of Ireland and the Irish national flower or plant is the lovely shamrock. The shamrock has inspired many a doll costume for me but I have often found that obtaining shamrock fabric has been like looking for a needle in a haystack. One would have thought that it would be so easy to get hold of it here in England, especially with Eire being just over the water but, would you believe, I had to buy it all the way from America! Here is a costume that I designed with some gorgeous shamrock fabric (from America!). It was well worth the search as it was just the perfect scale for Clea Bella again in this eighteenth century inspired dance costume called ‘Erin and the Magic Shamrocks’. Clea Bella dances the part of 'Erin' in the shamrock fabric costume. Whilst buying the shamrock fabric that I used for ‘Erin’ I came across some lovely shamrock trimming. It was a wide and a narrrower embroidered lawn that just happened to be the right length for a long tutu for Clea called ‘Shamrock Waltz’. The wide trim was about six or seven inches deep with green shamrocks dotted all over. The narrower trim was about an inch and a half wide with a scalloped border and matching shamrocks. I was able to cut a bodice front with a shamrock right in the centre. The bottom of the skirt had the narrower trim along the lower edge and this was also used for shoulder frills and a headdress. Clea Bella modelling 'Shamrock Waltz' long tutu. Not to be outdone, little Riley was in desperate need of a tutu but there was just not enough of the trimming left. So I used plain satin in white and emerald to make her her own little shamrock costume called ‘Shamrock Sweetie’. I desperately tried to buy more of that lovely trimming but sadly, to date, have never been able to find any more of it. It was such a shame as it was pure cotton and so lovely and fine….just perfect for doll work. Little Riley Kish in her 'Shamrock Sweetie' tutu costume. With all this talk of Ireland how could I resist talking about Irish dancing? I would have loved to have learnt Irish dancing but it was not to be. How lovely it would have been to be able to dance wearing some of those wonderful dresses that the girls get to wear. And those costumes take some making too. There is so much time and work in them. I found making an Irish dance costume for Clea quite a challenge but I was not going to let it beat me and with a lot of practice, I was able to make a pattern to fit her. I used pure silk dupion for the dress, lining and cape and some pretty little foil shamrocks finished off the decoration just nicely. Clea wearing her 'Call of Eire' Irish dance dress. Here is Clea Dancing so that you can see the lining colour. The fabric on the centre front of the bodice and the ends of the sleeves is a patterned gold lame. Showing the gold coloured lining of the skirt. And here is the back view showing the cape. Back view of Clea's Irsh dance dress. Of course, it wasn’t very long before one of the Kish girls wanted an Irish dress so it was back to the pattern drafting table for me. Although the Kish girls are the same height as Clea, they are a totally different shape around! I used silk dupion again along with the gold lame but decided to use an ivory colour with an emeral green lining. Unfortunately the camera wouldn’t show up the richness of the emerald and washed it out a bit which was a great shame so you will have to imagine a real, rich emerald green. Miss Kish models 'Kished in Eire'. Here is Miss Kish showing off her skirt lining that you have to imagine is rich emerald. She couldn't dance as well as Clea but how could I refuse her the dress?! Here is the back of the costume showing the machine embroidery on the cape. Back view of 'Kished in Eire' dance dress. Another image of Spring, apart from the flowers, are some of the animals that are associated with this season. Not least are the little Spring lambs jumping around in the fields. So cute and funny to watch. Last year I was asked to make a Georgian lady costume pattern for the British miniature magazine that I write ‘How to’s’ for. I chose the Shepherdess costume. This was a fashion craze in the eighteenth century for rich ladies to dress up as shepherdesses. They apparently found the image of the lonesome shepherdess rather romantic and wanted to portray this in the way they dressed. Many of them even kept little lambs on their lawns and pretended to look after them! Maybe this is where the nursury rhyme of Little Bo Peep came from……it seems that she wasn’t a very good shepherdess and was always losing her sheep! Anyway, here is the miniature Georgian Shepherdess along with her little lambs in a pretty counrtyside setting. Miniature Georgian lady in fancy shepherdess costume, complete with decorated crook and lambs. Of course I just couldn’t close without giving a little mention to the little Spring or Easter Bunnie (even thought Easter is so late this year!) So here is little six inch tall Riley Kish in her cute pink bunnie outfit. One cute little pink bunny outfit, modelled by Riley. If you enjoyed reading this March post please don’t be shy and leave me a little comment if you have the time please. I love to hear from my readers. Also, don’t forget to take a look at the AIM (Artisan’s In Miniature) on-line magazine. It is full of lovely, lovely miniature things by some wonderful miniature artisans. Click here to go straight there or you can use the AIM link in my blog roll on the right of my What’s New blog page. Costumes inspired by St. Valentine’s Day. I thought I would share with you some of the costumes and miniature dolls that I have made over the past few years that have been inspired by St. Valentine’s Day……can’t believe we are into February already! Where did January go?!! Back view of the ball gown showing puff detail, train and tails. The front view of the ball gown showing frills and trim. Front view of the miniature Valentine Ball gown.The flowers are a mixture of hand-dyed dried and hand-made silk. Back view of miniature version. Side view of the miniature Valentine Ball gown. Of course, pink is not the only popular colour used for costmes inspired by St. Valentine’s Day. Red is probably the most used and several years ago I found a gorgeous cotton fabric with tiny red hearts all over it. 16 inch Kish doll wearing 'Sweet Valentine Kishes' costume. 16 inch Clea Bella wearing 'Valentine Polka' ballet costume. Miniature dolls. The Queen wears the heart fabric for her under dress. Little Riley Kish wearing 'Funny Valentine' ballet costume. The tiny red foil hearts were 'table confetti'. SOME OF MY FAVOURITE PROJECTS FROM 2010. First of all, may I wish you all a very happy and peaceful 2011. I hope it will be all that you want it to be and more. As some of you know, 2010 wasn’t the happiest of years for me in my personal life but, what kept me going most of all, were the exciting and varied orders and commissions that I received from my wonderful customers. A big thank you therefore to all of you who helped make a sad year bearable. So, to welcome in the start of a new and hopefully much happier year I’d like to share with you pictures of some of the lovely items I was commissioned to make during 2010. Regency stove pipe bonnet modelled by 16 inch Tyler Wentworth. Made with pure hand-dyed silver-grey wool and lined with ivory silk. Side View of the bonnet showing the stove pipe shaping. Full length view showing the bonnet along with the matching pelisse (cape) and reticule (purse). Miniature Spencer jacket with matching bonnet and reticule. Made in pure silk and hand-dyed cotton lace. Side View of the bonnet. Miniature Regency wedding bonnet based on the one worn by Elizabeth Bennet in the BBC's 1990's TV drama 'Pride and Prejudice'. The bonnet is approx just under an inch tall. and is made from silk with shirred silk tulle along the length of the top, ending in a short veil. The little flowers are all hand-dyed by me. Something for the Maid. A much plainer cotton house dress and apron along with a little mop cap. For those of you who like the earlier Georgean (Colonial) era, an interesting order arrived where I had to’ miniaturise’ a larger Marie Antoinette style doll costume, complete with all the underwear. Miniature 18th Century Marie Antoinette style gown also in pure silk. The miniature version of the panniers with petticoat and hand-applied shoes. New Lilac Fairy tutu (from the Sleeping Beauty ballet). Detail on the top of the tutu. And finally a most enjoyable project came in the form of a miniature wedding gown based on the one worn by Burlesque star Dita Von Teese. Miniature version of the Dita Von Teese style gown in one twelfth scale with tricorn hat.Side view of gown. Close up of miniature stockings, suspenders and hand-applied silk and leather shoes. Dita style dress modelled by Barbie. Close up of the Tricorn hat. So, all in all there were some really different projects during 2010 and 2011 looks set to continue along that same path. See you all again soon. Don’t forget to check out the AIM (Artisans in Miniature) on-line magazine (see my blog links). HOW ONE THING OFTEN LEADS TUTU ANOTHER! Many people have asked me how my miniature fairy slippers, tutus and ballet costumes have come about. Well, it was one of those cases where one thing did indeed lead to another. But first I would like to tell you about a particular favourite order that I made for a young Australian ballet student. I am often asked to reproduce human-sized costumes into doll size and find this a very enjoyable challenge. I especially enjoy historical and ballet costumes and one of my favourite projects was when I was asked to make some tutus to fit the 16 inch Tonner NYCB ballerina doll. The doll’s costumes were commissioned by Sue, the mother of New Zealand ballet student, Katie and were for a birthday present. Katie was dancing in a competition and the doll’s costumes had to resemble as near as possible, both of Katie’s own tutus. Sue sent me some pictures of the Katie’s tutus and the rest was up to me. The first tutu was for the part of ‘Princess Aurora Rose’ from the famous ballet ‘The Sleeping Beauty’. This was an absolutely gorgeous tutu in pale peachy pink with lace, pearl and sequin detail on the bodice and top frill. Unfortunately I no longer have the close-up pictures of the lace detail that Sue sent me but here is a lovely picture of Katie dancing in this beautiful tutu. Katie dancing in her Aurora Rose tutu. This costume was made by Katie’s dancing teacher Philippa Campbell and the lace detail was applied by Katie herself. I found that I had both the right shade of pink silk for the bodice and tulle for the frills plus I was also able to find a really lovely cotton lace that could be cut about to make the details for the bodice and top frill. All the flowers on the lace had to be cut out separately and applied individually around the top of the bodice and down the centre front and then onto the top frill. I then applied all the pearls separately and finally the sequins were dotted over the rest of the top frill. Tulle arm frills were made to match the tutu frills and I made a headdress from wired beads. Here is a picture of the finished costume modelled on my own NYCB Ballerina doll. The finished doll-sized Aurora Rose tutu. Here is a close up of the lace, pearl and sequin detail. Close-up of the lace, pearl and sequin detail on the doll's tutu. The second costume was a really exotic style of tutu for the part of ‘Esmeralda’. This had a bodice in a dark shade of greeny- blue with matching lace sleeves and golden braid decoration, extending into shaped lace and decorated silk panels onto the top frill of the tutu. Katie dancing in the Esmeralda tutu. The top tutu frill was a paler shade of greeny-blue tulle and the rest of the frills were pale ivory in colour. There was also a headdress made from crystals. This costume was made by a professional Aukland tutu maker called Margaret Shore. Here are two lovely pictures of Katie wearing this gorgeous costume: one of her dancing and one of her receiving her prizes. Katie receiving her prizes in the Esmeralda tutu. For the doll’s tutu, I found a good match in dark greeny-blue silk dupion for the bodice and panels. The lace was more of a challenge as I had to dye this myself. After a bit of experimenting, the right shade was reached. I already had all the tulle for the tutu in stock as well as the trims. I have quite a stock of different bodice and sleeve patterns for tutus that I have made over the years so the only new pattern that needed making was for the decorated panels that sat on the top of the tutu skirt. Here is a close-up picture (below) of the tutu bodice detail. Close up of the detail on the doll-sized Esmeralda tutu. Close up of the Esmeralda doll headdress. The headdress was made from lengths of rhinestone chain wired together to fit the doll’s head. Having made a lot of tutus for the larger dolls, I decided to try scaling down to miniature size (one twelfth scale). I had already been dressing tutus onto the miniature dolls for some years but had not made a miniature tutu on its own without the doll wearing it. Experiments started and I found that my ideas worked out fine and I set about designing some miniature ballet costume sets. I decided to concentrate on four designs based on the most popular ballet characters. Miniature Aurora Rose tutu set. and the long white tutu from Giselle. I also decided to offer each tutu with a head dress on a wig, displayed on a stand and also a tiny pair of ballet shoes. The ballet shoes for the sixteen inch dolls were not made by me but were commercially produced by an American company but there didn’t seem to be anyone producing realistic looking miniature pointe ballet shoes. I realised that I would have to come up with a way of making them myself. I had made miniature ballet shoes onto my one twelfth scale ballerina dolls but never made the shoes on their own. I decided to dig my own old (and very well used) pointe ballet shoes out from the back of my wardrobe and take a closer look at them. My old (and very well-worn) pointe ballet shoes. After much fiddling around with tiny pieces of silk, I eventually worked out a way of making a one twelfth scale version under an inch in length. These completed the miniature ballet costume sets perfectly and even became popular on their own too. Gift boxed miniature ballet shoes. and these have proved very popular indeed, especially as I am able to produce them in a huge range of colours as well as the traditional flesh pink. Well, one thing led to another, as it so often does and the idea of miniature ballet shoes in gift boxes led me to thinking ‘Why not have gift boxed Fairy Slippers too?’ Once again experiments began and after much fiddling around ( although not as much as with the ballet shoes!) and these tiny pointy- toed silk slippers took shape. I offered these in decorated gift boxes again and in many different colours and they have also proved extremely popular. Gift boxed Fairy Slippers....A must for all smart Fairies! It just goes to show just how making one thing can lead to making several other related items. Without the tutus for the larger dolls, the miniature tutus would not have happened. Without those, the miniature ballet shoes wouldn’t have been developed and without those, the fairy slippers would not have happened. Alternative Colour Scheme for Swanhilda Ballet Costume. As a doll costume designer and creator, I always offer my work in alternative colour schemes to suit individual customers’ own tastes. Recently I was asked to do just this when a long-standing customer asked if she could order my Swanhilda ballet costume in a red and white colour scheme. (The original costume was made in shades of deep pink, pink floral and ivory). Since this was not a problem as far as fabrics were concerned I was more than happy to oblige and here is the result. I was pleased with this colour scheme as I felt it gave a lovely fresh and clean image, just a pretty as the pink scheme. New Colour Scheme for Swanhilda Ballet Costume. New Firebird Ballet Costume for 16 inch Dolls. Here is my new updated design on the Firebird ballet costume for 16 inch fashion dolls, modelled on Tonner’s NYCB ballerina doll. I have cut each tutu frill in uneven points to give a more ‘feathery’ and flame-like appearance. The tutu frills are then echoed at the top of the bodice. I also redesigned the head dress to reflect the design changes in the tutu. New Firebird Ballet Costume Design for 16 inch Fashion Dolls.